Onarga (population 1,438) is located in upper eastern Illinois in west-central Iroquois County. U.S. Route 45 cuts nicely through Onarga and meets up with Illinois Route 54. Interstate Highway 57 lies to the west of town and has exit ramps leading to Route 54. The Illinois Central Gulf Railroad lays some tracks through Onarga as well. Onarga lies about 30 miles southwest of Kankakee. Onarga was being settled in the early 1800's and became incorporated as a town in llinois in 1853. In the early 1860's, Onarga had a population of 273. The history of the educational opportunities for the kids of Onarga is long and very storied. The first school building was a wooden structure construted in 1858. 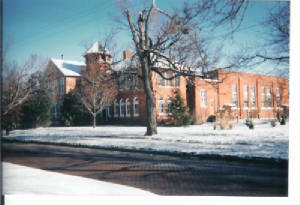 The growing town realized the need for a larger structure and constructed a brick school building in 1867. 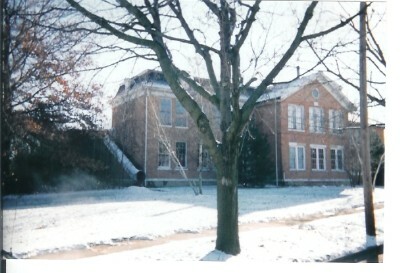 The growing student population forced the addition of rooms to the building in 1872. This original building served Onarga for many years until its replacement by a newer building in the 1920's (pictured above). Onarga residents supported their own high school until the early 1980's, when in 1983, the residents of Onarga, Gilman, and Danforth agreed to pool their resources. Their consolidation effort led to the creation of the Iroquois West School District. The high school for the new school district was located in Gilman. 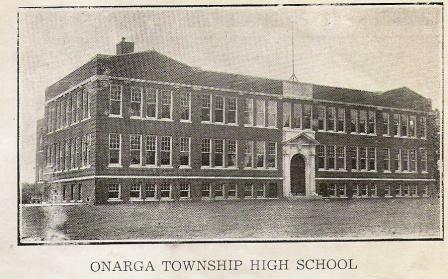 The Onarga school building from the 1920's (pictured at the top of the page) is now used as a junior high school for the Iroquois West School District. Onarga High School definitely offered the boys' sports of basketball, football, and track. Baseball may have also been offered at the school. The girls competed in basketball and track for sure, possibly volleyball as well. We are missing some information on the Onarga athletic program, such conference affiliations, names of great players, ect. If you have any of these items, please let us know.. The boys basketball program has a very comprehensive listing on the IHSA website (www.ihsa.org). Over the years, the Onarga boys won a total of five District titles and one Regional title. Some of the early season records are not available. The best of the seasons for Onarga HS are listed below. The ladies of Onarga High School won a Regional title of their own in their very short history. The girls of the 1976-77 season pulled off this feat in the original one-class system. Unfortunately, the team record is not available. The Onarga thinclads had some great success in the early 1920s. One athlete, E. Morgan, led the team of 1921-22 to an eighth place finish in the 1922 'B' Track meet. Two boys of the 1932 team, Charters and Kanosky, also medaled in the one-class system. The medals earned and final team standings of the 1922 meet are listed below. Onarga had a remarkable run in the late 1950's. They won 29 consecutive Vermillion Valley conference games in a row between 1953 and 1958. They also notched 3 consecutive overall undefeated seasons with 21 overall wins in a row. Thanks to Tom Sikorski for this information. 1951 4-3-1 3rd Place Vermillion Valley Conf. Onarga last independently fielded a football team in 1979. Their last game was a 28-0 win over Cullom Tri-Point. The thespians of Onarga High also left their mark. The team of 1942-43 won their Sectional competition and qualified for the State Competition. John Uphoff led the team with a medal at the State Finals! One student at Onarga High School brought home a State Champion trophy and led the team to a SIXTH Place overall finish! Great job William Whitlow!! 1949-50 Team Finished SIXTH in STATE Competition!! William Whitlow Comedy STATE CHAMPION! !